The Tribeca shower door will add beauty to any homeowner's bathroom. Its curved clear tempered glass will open up any space and will surely enhance the appearance of your bathroom. Tribeca 38-Inch Sliding Shower Door with Base and Walls The Tribeca shower door will add beauty to any homeowner's bathroom. Its curved clear tempered glass will open up any space and will surely enhance the appearance of your bathroom. Tribeca 38-Inch Sliding Shower Door with Base and Walls is rated 4.0 out of 5 by 2. Rated 4 out of 5 by Switchy from Good Quality I am very happy with this product. Everything you need for assembly is there. packaging is good. Quality is good. fit and finish is perfect. Base standoffs needed a little fine tuning but otherwise was solid with no noticeable flex when carefully shimmed to match the floor. Doors roll nicely and seal very well. Glass sides and doors with a white interior keeps things bright and access is good through a wide sliding door opening. I had to sand down two of the standoffs to keep the base from rocking otherwise would have rated it 5 stars. Rated 4 out of 5 by caw01 from Wrong Spec Sheet Good value for the price. However, do not use the attached spec sheet to plan a bathroom. The item is listed as a 38" shower, however the spec sheet has it listed as a 36" shower. I gave the spec sheet to our plumber and now our toilet is not centered..... we made it work, but a nuisance we shouldn't have to deal with. Hello I am finding the specs a little confusing. In one location it says 38&quot;, and another it says assembled 40&quot;. Same goes for the height, it says 73&quot; in one area, and 75&quot; in another? Clarification please? I am also wondering if there is a 36&quot; model? 40&rsquo;&rsquo; is with walls, it&rsquo;s 73&rsquo;&rsquo; is with base. No we have no 36&rsquo;&rsquo; model. The walls are made out of acrylic. Is the overall height of this shower from floor to the top of walls 75 inches? What are the walls made of? The height is 70&rsquo;&rsquo; without base 73 with the base. The base is 3&rsquo;&rsquo;. The walls are of acrylic. Good evening. I would like to buy the Tribeca 38-Inch Sliding Shower Door with base and walls. My current shower drainage has a distance of 15 inches from the wall on both sides. Is the drainage of Tribeca base fit to my drainage? Thank you so much. 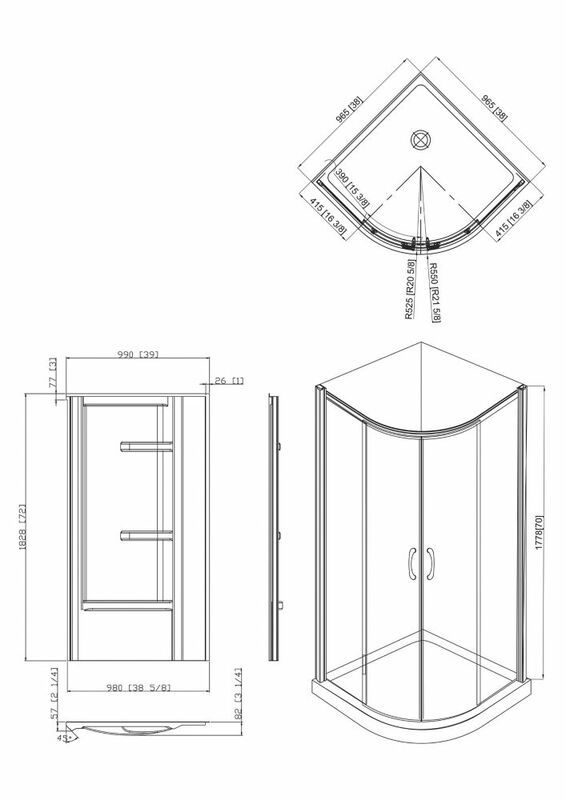 Good morning, Our base is 12'' x 12'', there is a way to install this base nevertheless you would have to install a joint pipe to the drain body. Is this unit available without walls? Unfortunately not it only come with walls. Is this shower 38&quot; or 36&quot;? If it is 38 does it come in 36&quot;? This unit is 38''. Yes it comes in 36'' but we are out of stock at the moment. Expected time is end of October.